The first section of the Karpas, before Ziyamet, has the largest number of sites to visit, albeit minor, and for those with the time and inclination to explore fully, there are three possible detours from the main road. Starting at Boğaz, the first is at the turn-off right (south) towards the west at Kalecik. There is no signpost but the landmark is the group of oil storage tanks visible some kilometres away on the coast. 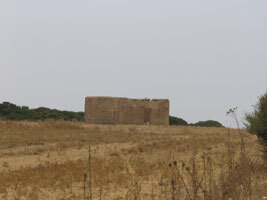 Kalecik means "little castle" and by the sea near the tanker terminal are the heavily ruined 12th-century twin Templar castles of Kastros and Strongylos. A few foundations and cisterns are all that remain today. Nearby is the ruined chapel of Ayios Ioannis. In the village itself, the school is a former Byzantine church. Kalecik is the second port of North Cyprus after Gazimağusa and before Girne, used for exporting quantities of cargo, especially the tobacco grown in the Karpas, and for importing oil. It has no passenger traffic. At Tuzluca, the village on the crossroads to the north, the curious can seek out the large stone to be found in the old churchyard. The stone has a hole in the middle and local tradition held that every Easter Monday, if the married men of the village clambered through the hole, they could check that their wives had remained faithful. Any that had been cuckolded got stuck because of their "horns" and having extricated themselves, rushed off to beat their wicked spouses and begin divorce proceedings. Records show that the last such event occurred in 1935. With scarcely 600 inhabitants one would have thought the opportunities for infidelity were limited, and the chances of keeping it quiet even more so. At Çayırova (Greek Ayios Theodhoros), the next village on the way to Ziyamet, an 8km dirt track forks south to the headland of Zeytin Burnu, Olive Cape (Greek Cape Elea). Here, to the right of the track, close to the sea, are the ruins of ancient Phoenician Cnidus set in a natural harbour. Today they are scarcely visible among the ploughed fields, but the town was inhabited from the 5th century BC until the 2nd century AD. From Çayırova you can take the fork to the north to the village of Zeybekköy, then to the right again to the hamlet of Sazlıköy (Greek Livadhia). At the foot of the hill behind this village, alone in a bucolic setting, you will see the pretty little church of Panayiatis Kyras, thought to be 7th century. It can be approached from a track to the left that starts directly opposite the mosque, but most of the last section has to be done on foot, about five minutes across the fields. Empty and desecrated, it has a little arched side entrance with a charming sitting area. Inside there was a mosaic of the Virgin, now largely disappeared as a result of the local superstition that a cube of the mosaic would, if kept in a pocket, banish pimples and spots. A fork south from Çayırova leads to the village of Bafra, and beyond to a sandy bay where an uncompleted holiday village stands awaiting its fate. Further north at Kumyalı a fork off to the harbour leads to a sandy beach. In the village itself, raised up on a hillock, is a small 15th-century church built above an ancient tomb, and all around are vestiges of a classical necropolis. Copyright © 2006, North Cyprus Hotel and Holiday Guide.